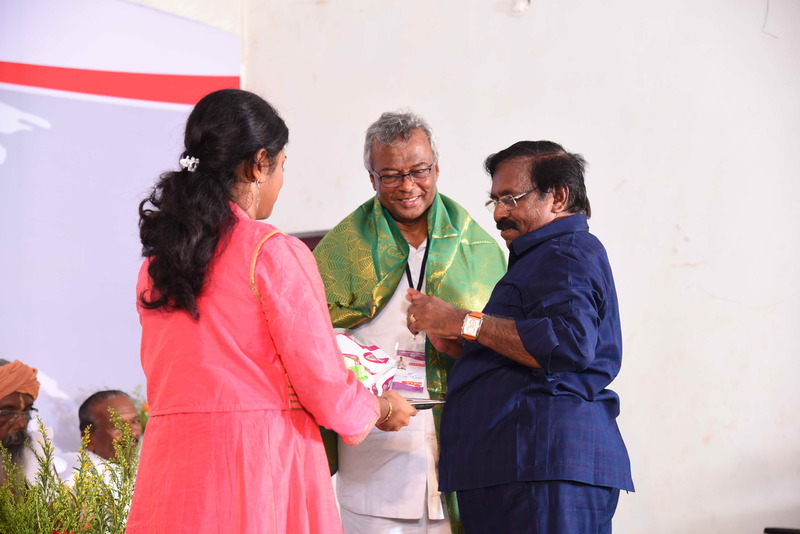 The three-day event, which will be held from May 17 at Scott Christian College, Nagercoil will see the presentation of 130 research papers. 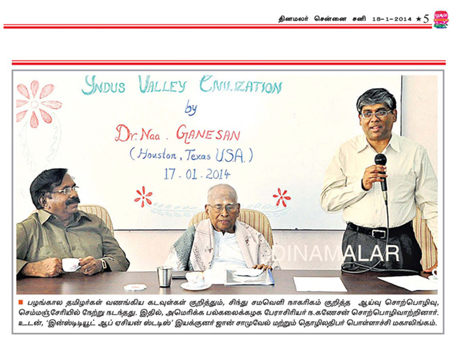 Scholars from 20 nations would participate in addition to the scholars from various parts of India,â€� Dr. Samuel said. â€œWe shall pass a resolution at the conference urging Unesco to declare it as Book of the World. 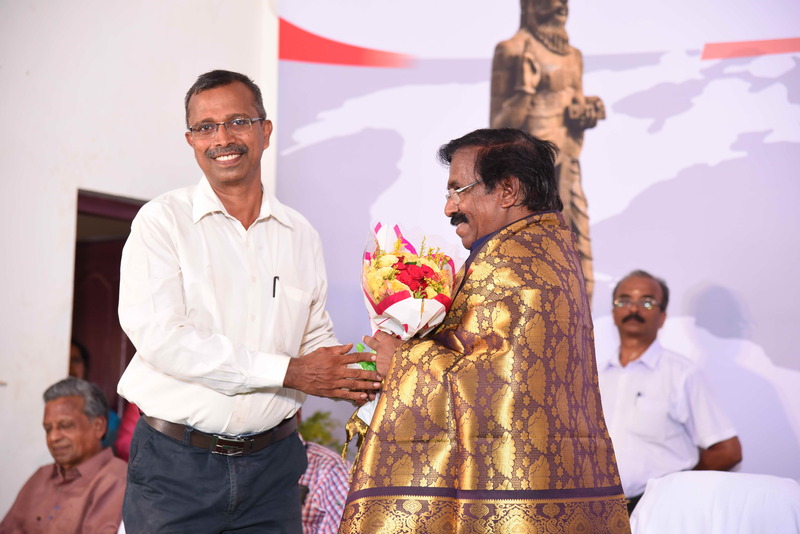 Also, we have planned to conduct the next Tirukkural conference on the premises of Unesco in Paris in 2020,â€� says Dr G. John Samuel, Founder-Director, Institute of Asian Studies, Sholinganallur, here. Prof. Armoogum Parsuramen, Chairman, International Association of Tamil Diaspora (INTAD), Mauritius., would preside over the conference. 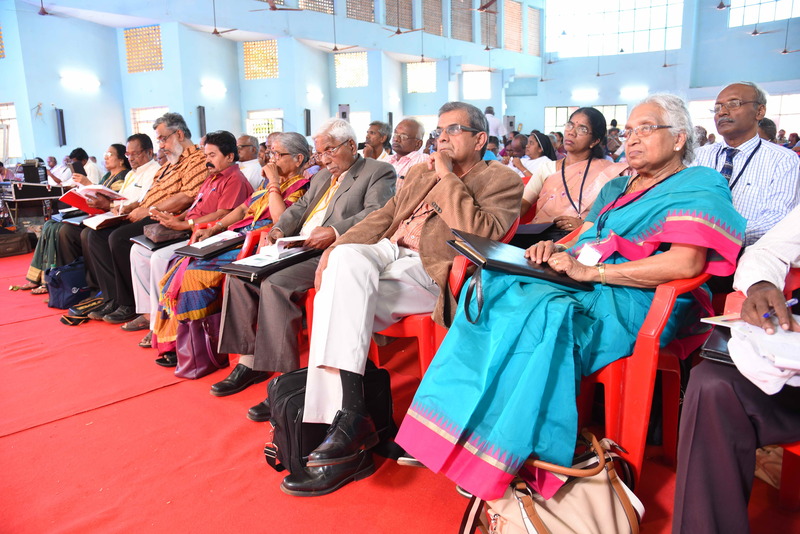 The three-day event, which will be held from May 17 at Scott Christian College, Nagercoil will see the presentation of 130 research papers. â€œA 550-page souvenir will be released on the occasion. 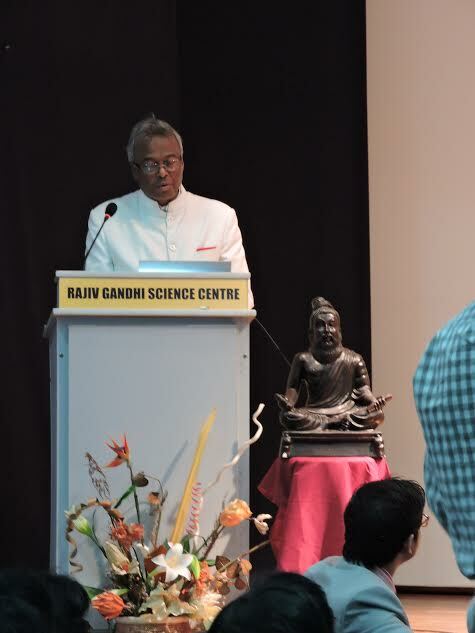 Scholars from 20 nations would participate in addition to the scholars from various parts of India,â€� Dr. Samuel said. 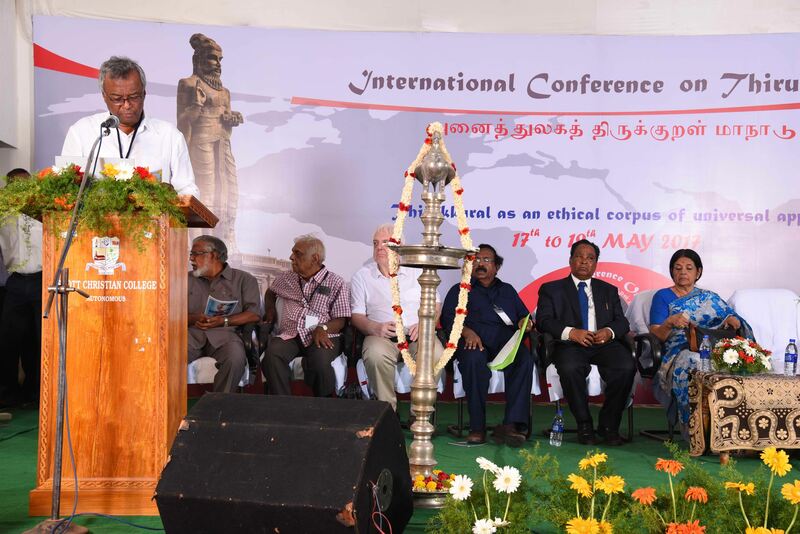 The conference is being held under the joint auspice of Institute of Asian Studies, Chennai, and International Association of Tamil Diaspora (INTAD), Mauritius. Close to Nagercoil, is the majestic 133 feet high Tiruvalluvar statue gracing the confluence of the tri-seas off the coast of Kanyakumari, along with the Vivekananda Rock Memorial. 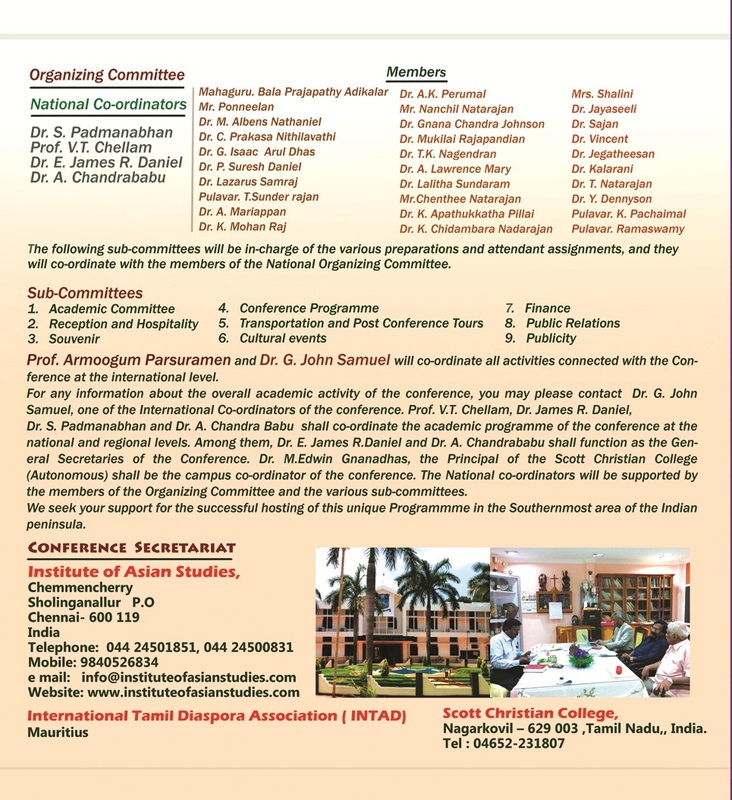 Warm Greetings to you from the International Association of Tamil Diaspora (INTAD), Mauritius and the Institute of Asian Studies (IAS), Chennai, India. 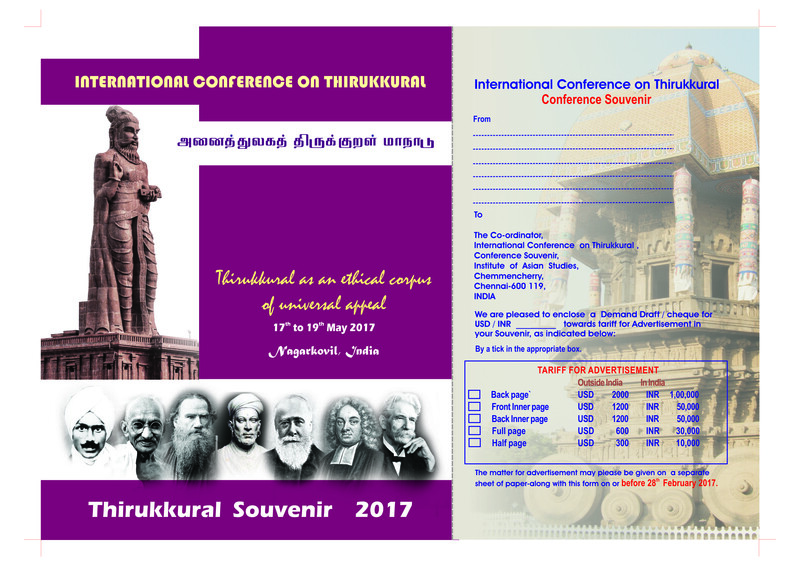 We have great pleasure in inviting you to the International Conference on Thirukkural to be held in Cape Comorin (Kanniyakumari), the Southern most region of the Indian Peninsula, from 17th to 19th May 2017. 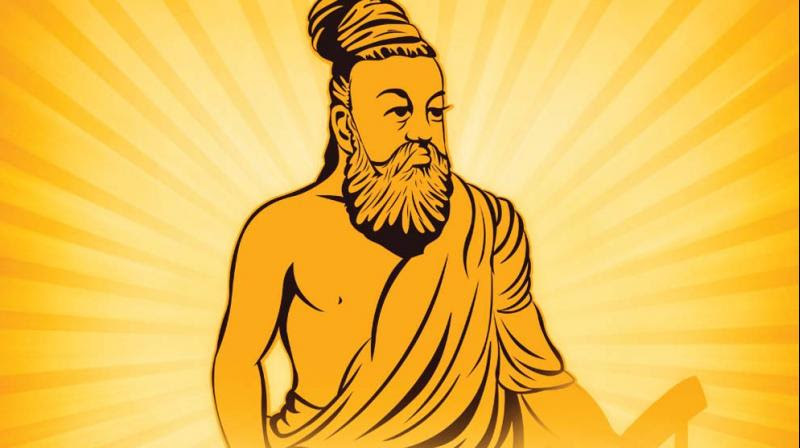 Thirukkural - composed by Thiruvalluvar, some 2000 years ago, in classical Tamil - has acquired over the ages the status of scriptural authority as a canon informing the behaviour of Tamils in their day-to- day interpersonal relations all over the world. Every Tamil can recite from memory some kural couplet appropriate to the situation or predicament he may find himself in. No Tamil will dispute the pride of place Thiru-Valluvar occupies in his heart and esteem. Despite his humble origins, he reigns supreme as the foremost poet and philosopher in the Tamil Pantheon. This collection of epigrammatic sayings, observations and admonishments on a vast variety of topics concerning the regulation of life within the kingdom and the proper place and delineation of each class of individuals according to his or her social, political and domestic duties and roles belongs among the great treatises of universal literature, such as Confucious' Analects or the Senecan Epistulae Morales. This insightful treatise on human behaviour within the compass of ancient South Indian society incorporating by and large the collective consciousness of Tamils occupies the most eminent place in the genre of didactic Tamil literature. 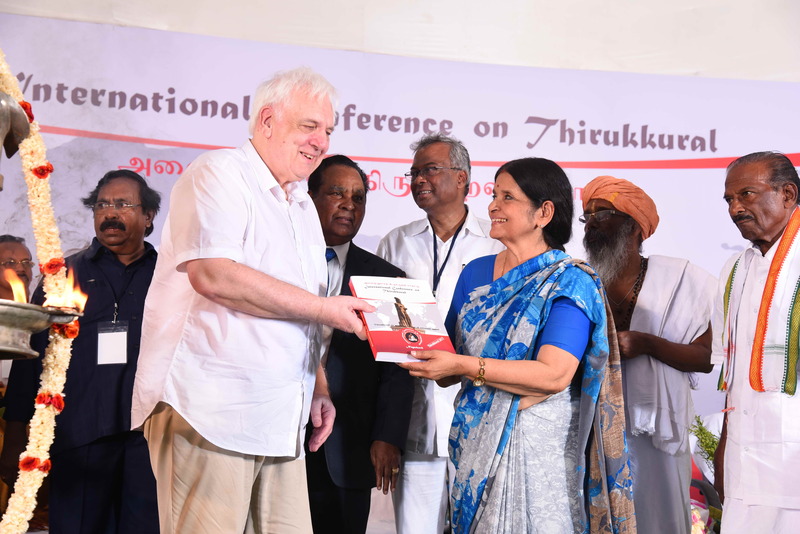 Hailed as an universal book of wisdom par excellence, the work provides ethical precepts for the development of character and the transcending of religious, caste-ial and other socio-political misconceptions which hinder peaceful co-existence. This book of epigrammatic couplets on human nature has been compared to many of the world's scriptural texbts, such as, the Hebraic Proverbs, the ethical corpus of the Greek tradition, the rich Confucian gnomic heritage and the holy texts of Buddhism and Jainism. The Thirukkural is almost in its entirety secular in nature, and it is not otherwise biased. No God or Goddess is mentioned by name in this great legacy of mankind. Yet, Thiruvalluvar is religious in his own way. The entire text revolves around the conceptual realisation of the ideal man -- the 'superman' envisaged by Thiruvalluvar who is, namely : Cànròn, and who embodies five noble qualities, to wit : love, truth, compassion, good judgment and the upholding of character, devoid of blame. The God or Goddess in the Thirukkural is the paragon of Virtue or Righteousness, popularly designated by the Tamil term Aram. Aram is the presiding deity in this great work and Cànròn the sought-after étre, the Jünzi of the classical Chinese Canon of Change. As such, Thirukkural enjoys the reputation of being a book of moral preachment, memorable for its felicitous phraseology in euphonic cadences and alliterative mnemonics when quoted aloud in Tamil, a book whose tenets show the way out of national, religious, linguistic and ethnic confrontations. This enduring Tamil classic comprising 1330 couplets is made up of 133 topics (each the subject of ten nuanced elaborations of couplets), the entire work being devoted to three major themes: Aratthuppal (On Virtue, 380 couplets), Porutpal (On the Management of Wealth in the Princely State, 700 couplets), and Kamatthuppal (On Carnal Love: Pre-and-Post Marital, 250 couplets) composed in strict concordance with classical Tamil prosodical rules, called kuratpa. In a way, Thirukkural deals with the typical akam-puram (INTERNAL and EXTERNAL) aspects and modes of life in Tamil classical poetry, conventions especially en vigueur during the early Cangam Period. The first section of this work: Aram concerns itself with the lives and duties of the householder and the ascetic, and Porul, the second section, treats of man's responsibilities in societal life at large in the princely kingdom belongs to the puram category; the third section: Kamam presents the emotional and/or sexual relationship between man and woman in its premarital and wedded phases belongs to the Akam type. 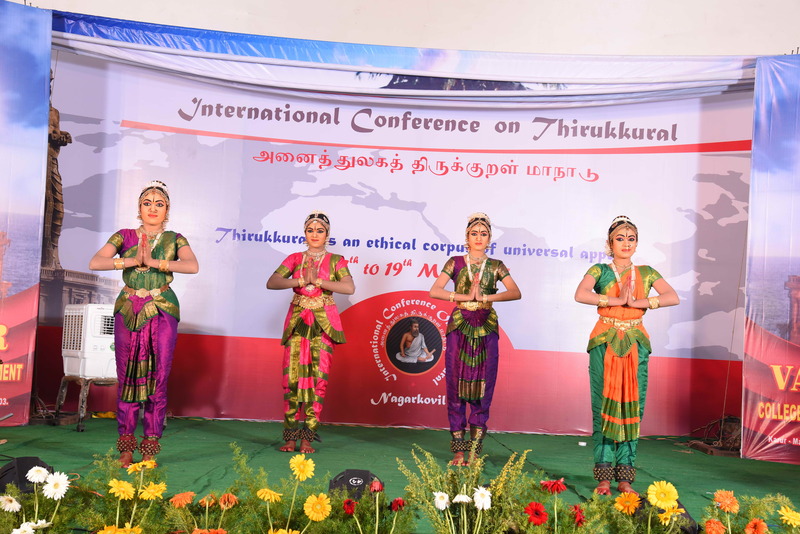 The universal appeal of the Thirukkural has attracted Asian scholars and numerous European missionaries to our shores, and they have translated it into almost all the major languages of the world. While the German Lutheran missionary Ziegenbalg introduced this great classic to his patrons in Germany in 1708, the Italian Jesuit missionary Beschi has translated it into Latin in 1730. Scholars of international repute, including the Nobel laureate Dr. Albert Schweitzer, and great leaders like Mahatma Gandhi have showered praise on this unique masterpiece. Dr. Albert Schweitzer wrote: " There hardly exists in the literature of the world a collection of maxims in which we find so much of lofty wisdom". Mahatma Gandhi described it as "a text book of indispensable authority on moral life. the maxims of Valluvar have touched my soul. There is none who has given such a treasure of wisdom like him". Gandhiji, it might be worthwhile recalling, came to know about Thirukkural from Leo Tolstoy, who had said that the concept of "non-violence" was taken by him from a German version of the Kural. Monsieur Ariel calls it " a masterpiece of Tamil literature, one of the highest and purest of expressions of human thought". Subramaniya Bharathi, the gifted Tamil poet of Indian Independence struggle repute, considered the Kural as the foremost gift of the Tamil population to humanity at large. 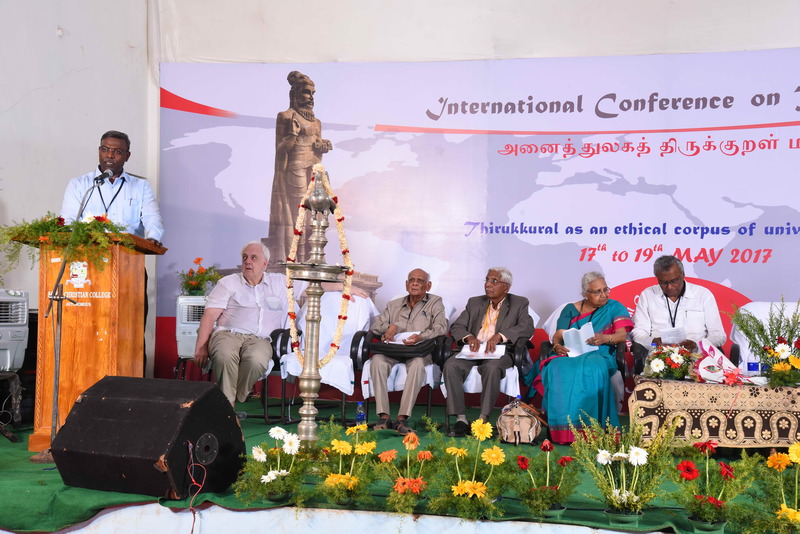 With a view to studying the Thirukkural from an unbiased international perspective and to promoting rigorous academic research on this sacred opus majeur, we have decided to organize this conference with the participation of scholars from all over the world. The following are the tentative topics for deliberation. This conference will form a prelude to the next international conference which we are planning to organize in Paris in 2020 with the collaboration of the UNESCO. Tentative areas of Academic deliberation: All the 50 topics broached here, tentatively, are brought under the following six broader headings or area studies. 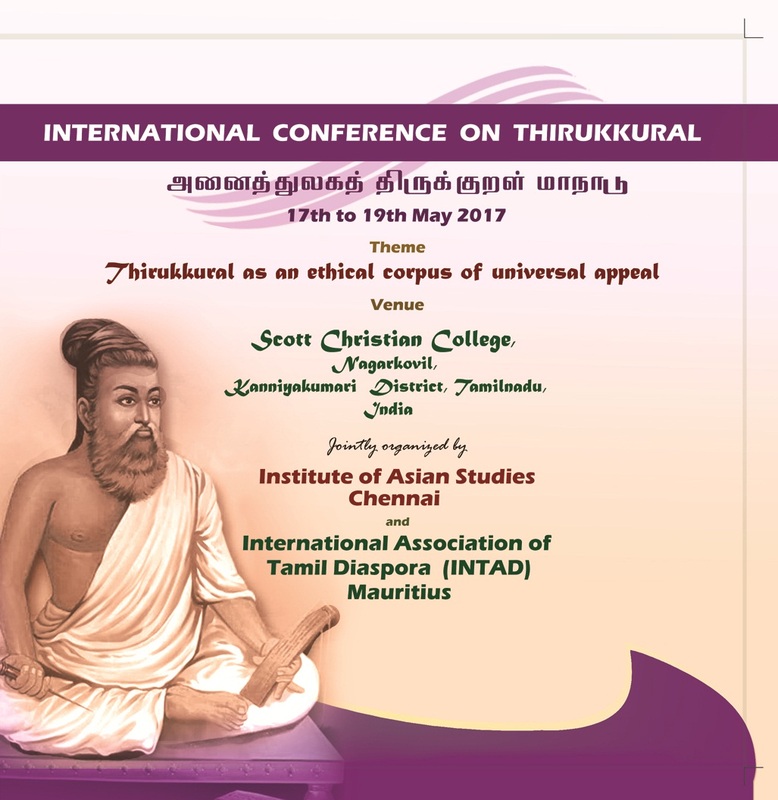 Thirukkural and the early corpus of Ethical Literature. Evolution of Didactic Literature with focus on Thirukkural. Thirukkural and Early Hebraic Literature. 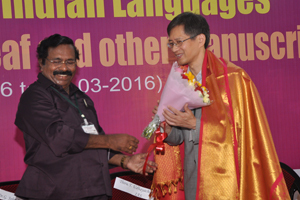 Thirukkural and Early Chinese Literature. Thirukkural and Hesiod’s Works and times. Is Thiruvalluvar comparable to Plato and Aristotle ? 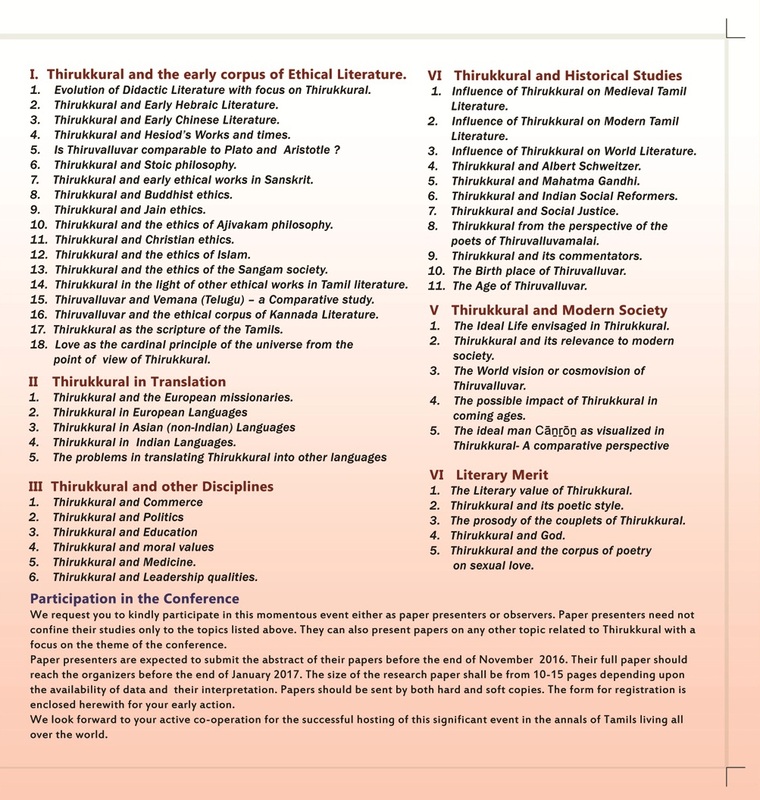 Thirukkural and early ethical works in Sanskrit. Thirukkural and the ethics of Ajivakam philosophy. Thirukkural and the ethics of Islam. Thirukkural and the ethics of the Sangam society. 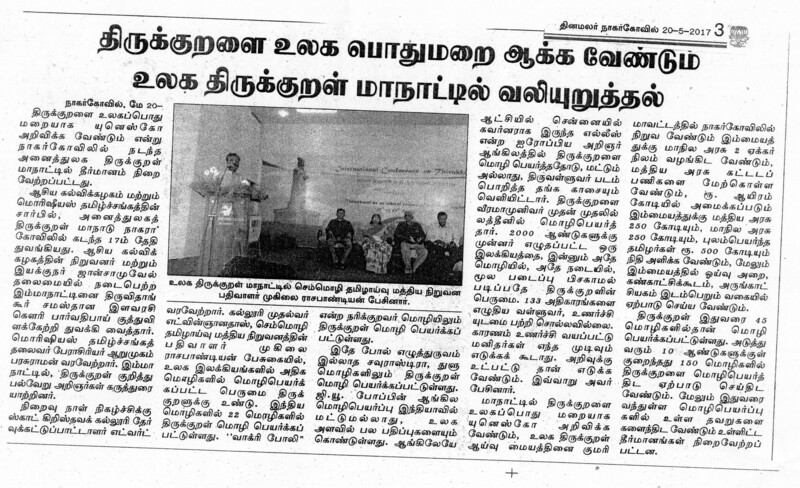 Thirukkural in the light of other ethical works in Tamil literature. Thiruvalluvar and Vemana (Telugu) – a Comparative study. Thiruvalluvar and the ethical corpus of Kannada Literature. Thirukkural as the scripture of the Tamils. Thirukkural and the European missionaries. The problems in translating Thirukkural into other languages. Influence of Thirukkural on Medieval Tamil Literature. 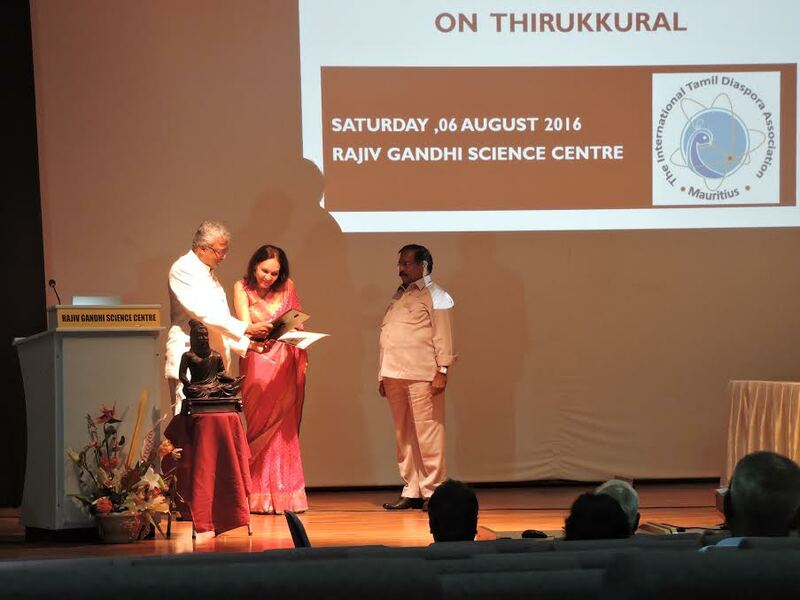 Influence of Thirukkural on Modern Tamil Literature. 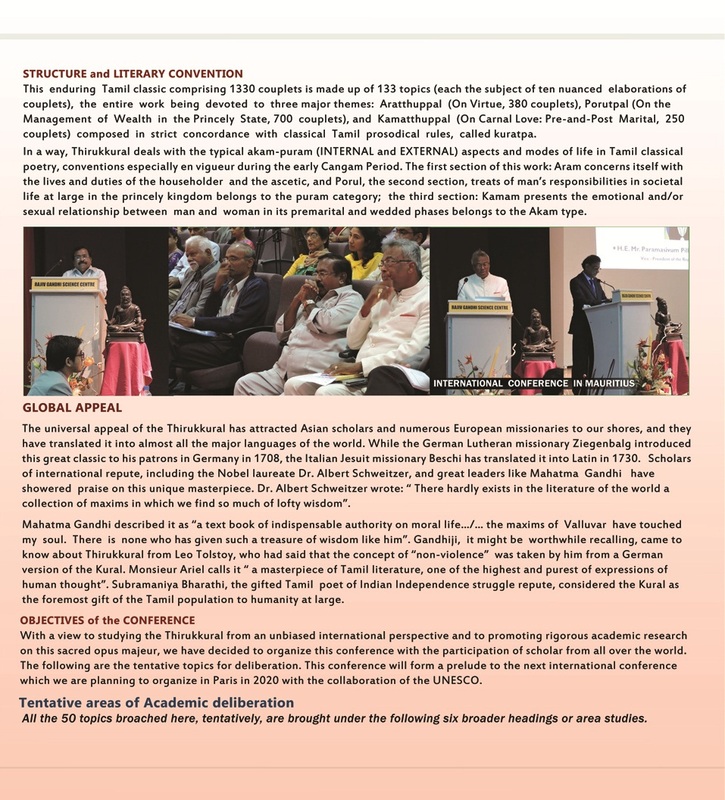 Influence of Thirukkural on World Literature. Thirukkural and Indian Social Reformers. Thirukkural from the perspective of the poets of Thiruvalluvamalai. The Birth place of Thiruvalluvar. The Ideal Life envisaged in Thirukkural. Thirukkural and its relevance to modern society. 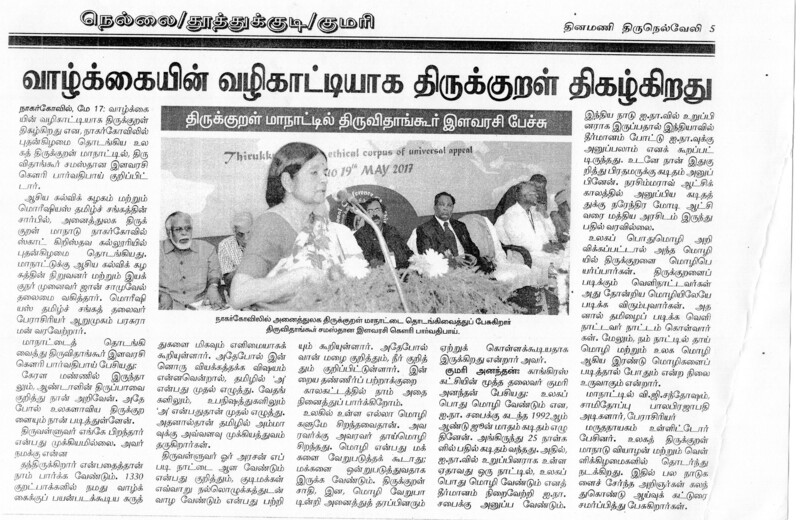 The World vision or cosmovision of Thiruvalluvar. The possible impact of Thirukkural in coming ages. The Literary value of Thirukkural. Thirukkural and its poetic style. The prosody of the couplets of Thirukkural. Thirukkural and the corpus of poetry on sexual love. We request you to kindly participate in this momentous event either as paper presenters or observers. Paper presenters need not confine their studies only to the topics listed above. 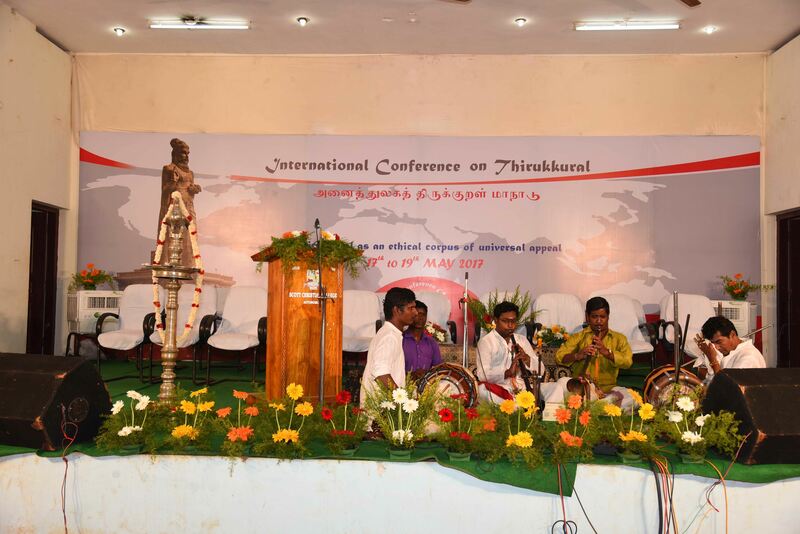 They can also present papers on any other topic related to Thirukkural with a focus on the theme of the conference. Paper presenters are expected to submit the abstract of their papers on or before 31st December 2016. Their full paper should reach the organizers before the end of January 2017. The size of the research paper shall be from 10-15 pages depending upon the availability of data and their interpretation. Papers should be sent by both hard and soft copies. The form for registration is enclosed herewith for your early action. We look forward to your active co-operation for the successful hosting of this significant event in the annals of Tamils living all over the world. மொரிசியசு நாட்டில் திருக்குறள் தொடர்பான தேசிய மாநாடு இம்மாதம் 6-ஆம் நாள் மிகச்சிறப்பாக நடை பெற்றது. அனைத்துலகப் புலம் பெயர்ந்து வாழும் தமிழர்கள் அமைப்பு (ஈந்TஆD), சென்னை, ஆசியவியல் நிறுவனத்தின் கூட்டுறவோடு இம்மாநாட்டிற்கு ஏற்பாடு செய்திருந்தது. மொரிசியசு நாட்டின் முன்னாள் கல்வியமைச்சரும், கஅபபஅ(யுனெசுகோ) நிறுவனத்தின் முன்னாள் இயக்குநரும், மொரிசியசு நாட்டில் அமைந்துள்ள அனைத்துலகப் புலம் பெயர்ந்து வாழும் தமிழர்கள் அமைப்பின் தலைவருமானபேராசிரியர் ஆறுமுகம் பரசுராமன் அவர்கள் இம்மாநாட்டின் அனைத்து நிகழ்ச்சிகளையும் ஒருங்கிணைத்துப் பன்னாட்டுத்தரத்துடன் மிகச்சிறப்பாக நடத்தினார். மொரிசியசு நாட்டின் குடியரசுத் துணைத்தலைவர் மாண்புமிகு பாலன் வையாபுரி மாநாட்டினைத் தொடக்கி வைத்தார். 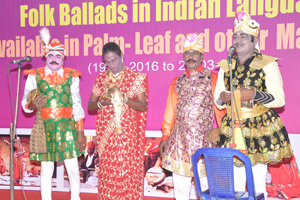 இந்நாட்டின் பல்வேறு பகுதிகளில் வாழும் தமிழர்கள் ஏந்தி வந்த திருக்குறள் ஒளியினை ஆசியவியல் நிறுவன இயக்குநர் முனைவர். ஜான் சாமுவேல், பேராசிரியர் ஆறுமுகம் பரசுராமனிடம் வழங்கினார். மகாத்மாகாந்தி நிறுவனப் பொது இயக்குநர் மாநாட்டில் வாழ்த்துரை வழங்கினார்..
மையக்கருத்துரை வழங்கிய பேராசிரியர் பரசுராமன் புலம்பெயர்ந்து வாழும் தமிழர்களிடையே திருக்குறள் குறித்த விழிப்புணர்வினை ஏற்படுத்தவும், பல்வேறு நாடுகளில் வாழும் தமிழர்களை இணைக்கும் இணைப்பு பாலமாகத் திருக்குறள் அமைய வேண்டிய நிலையினை எடுத்தியம்பவும் இம்மாநாடு நடத்தப்படுவதாகக் குறிப்பிட்டார்..
இம்மாநாட்டினைத் தொடர்ந்து அடுத்த ஆண்டு வைகாசி 3-5, 2048 / மே 17-19 2017 ஆகிய நாட்களில்கன்னியாகுமரி மாவட்டத்தில் பல்வேறு நாடுகளைச் சார்ந்தோர் கலந்து கொள்ள வகை செய்யும் நிலையில் அனைத்துலகத் திருக்குறள் மாநாட்டினை ஆசியவியல் நிறுவனத்தோடு இணைந்து நடத்தப் போவதாகவும் அவர் அறிவித்தார்..
மேலும் 2020 ஆம் ஆண்டில் யுனெசுகோவுடன் இணைந்து பிரான்சு நாட்டின் தலைநகரான பாரீசில் மற்றுமொரு அனைத்துலகத் திருக்குறள் மாநாட்டினை நடக்கவிருப்பது பற்றியும் அவர் குறிப்பிட்டார்..
ஆசியவியல் நிறுவன இயக்குநர் முனைவர் ஜான் சாமுவேல் "திருக்குறள் உலகப்பொதுமறை" என்ற தலைப்பில் ஆங்கில மொழியில் சிறப்புரையாற்றினார்..
சென்னையிலிருந்து வருகை வந்த மருத்துவர் மு.செம்மல் ‘திருக்குறளும் உடல்நல மருத்துவக் கல்வியும்’ என்ற தலைப்பில் உரை நிகழ்த்தினார்..
மொரிசியசு நாட்டைச் சார்ந்த மருத்துவர் யுவன், வழக்கறிஞர் நித்தியானந்தம். திருமதி. சந்தான வெளியன் ஆகியோரும் உரையாற்றினர்..
புலம் பெயர்ந்து வாழும் தமிழர்கள் குறித்த முதல் மாநாடு மொரிசியசு நாட்டில் 2014 ஆம் ஆண்டு நடைபெற்றது. இரண்டாவது மாநாட்டினை அடுத்த ஆண்டு (2017) ரீயூனியன் நாட்டில் ஐப்பசி 17-19, 2048 / நவம்பர் 3-5, 2017 ஆகிய நாட்களில் ஆசியவியல் நிறுவனத்தோடு இணைத்து நடத்துவதாக முடிவு செய்யப்பட்டது.. Available in Palm- leaf and other Manuscripts. 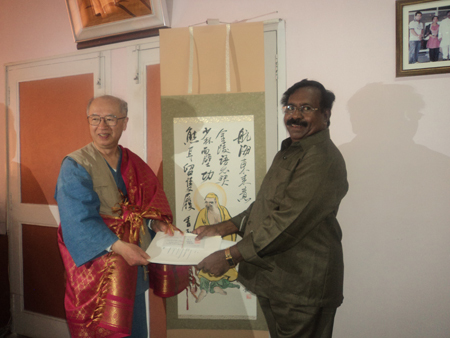 Institute of Asian Studies, Chennai and National Mission for Manuscripts, Govt. of India, New Delhi. 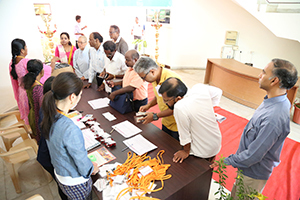 The above academic programme was a resounding success with the participation of scholars from various states of India and from various countries including the United States of America, Canada and Japan. 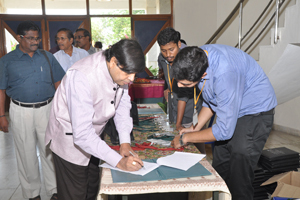 35 academic papers have been presented on various aspects of the above theme. 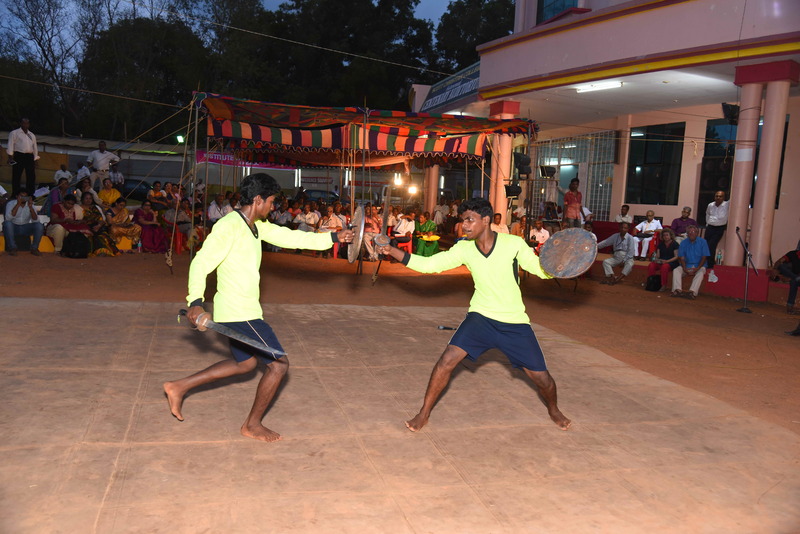 Two significant cultural programmes - one on Villuppattu and the another on Udukkaippattu have been organised. The following are the few photographs to mark this significant event. 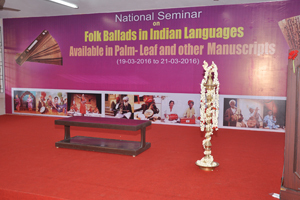 The deadline for the submission of abstract of the papers for the National Seminar on Folk Ballads in Indian languages available in Palm-leaf and other manuscripts has been extended to 25th January 2016 from 15th January 2016. We request the delegates to send their abstract before 25th January. ORGANISED BY THE INSTITUTE OF ASIAN STUDIES. A five-day book exhibition is going to be organized by the Institute of Asian Studies from 13th to 17th of August 2015 at its premises in Chennai with the support of the National Book Trust of India, New Delhi. Book-sellers and publishers may contact the Director of the Institute of Asian Studies for further details. 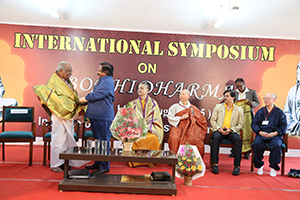 This International Symposium was aimed at studying the life, teachings and influences of Bodhidharma, a Buddhist monk from Tamil Nadu who went to China during the 6th century A.D. The Chan school of Buddhism which he established there continues to impact the lifestyles of the peoples of Asia. 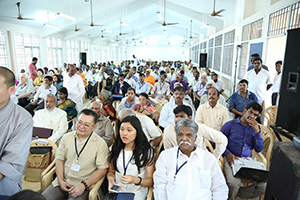 This worldwide programme was organized jointly by the Institute of Asian Studies, Chennai, the Institute of Seon(Zen), South Korea, Shaolin Temple, China, World Association of Bodhidharma, Japan, International Association of Tamil Diaspora, Mauritius, United Universe Bodhidharma Centre, Hongkong and a few other centres of international reputation with the support of the ICCR, Government of India. The need for peace is much more deeply felt today, as the problem of extremism and terrorism have plunged many nations into bloody and destructive armed struggles. 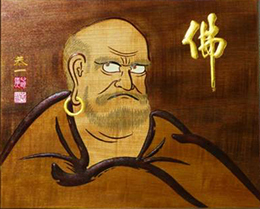 The understanding of Bodhidharma will help build up a safer world for future, a world without wars and conflicts, disputes in the name of languages and races - a place where mankind lives in peace and prosperity without any threat or sense of fear. The deliberations of this conference aimed at building peace and solidarity among the peoples of various countries and this will help promote better understanding about the rich cultural heritage of the various nations. 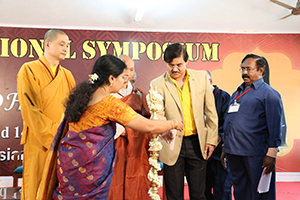 The two day event was inaugurated by Ven. Shi Yan Lin , the Executive Director of the world famous Shaolin Temple in China which gave shelter to Bohidharma. Ven. 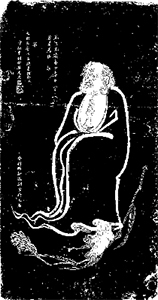 Shi Yan Lin traced the history of the Zen from its founder Bodhidharma. Ven. Jinwol, the Director of the Seon Institute in South Korean made a good survey of the impact of the legacy of Bodhidharma in Korea. 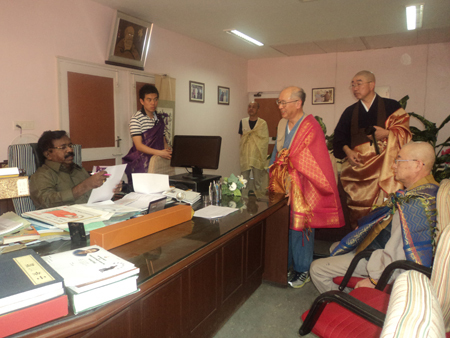 Dr. Tsutomu Kambe, the Vice President of World Bodhidharma Association in Tokyo, spoke elaborately about the impact of Bodhidharma in the life style of the people of East Asia, especially on the rich cultural heritage of Japan. 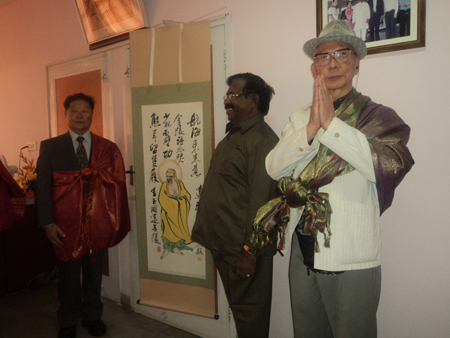 The former Malaysian Tamil Minister Tan Sri Dato Kumaran, and Dr. M.J. Mohan, the Chairman of the Venkatesha Education Society, have given glowing tributes to Bodhidharma and his achievements. 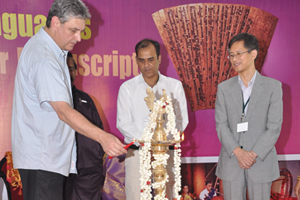 Eighty research papers were presented by various scholars from 18 different countries. The three major components of any study on Bodhidharma- which are explained as the three M’s-namely Meditation, Martial Art and Medicine, have become the major areas of deliberation and most of the papers revolved around these areas of academic pursuits. Many scholars from the East and the West, including Prof. Gregory James from UK (now in Hongkong) discussed about the popularity of Bodhidharma in Europe and Asia, with a special focus on Zen meditation. 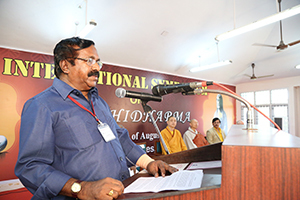 There are very good papers connecting Bodhidharma with Kalari and Varmam, the martial arts of Kanyakumari and Kerala. 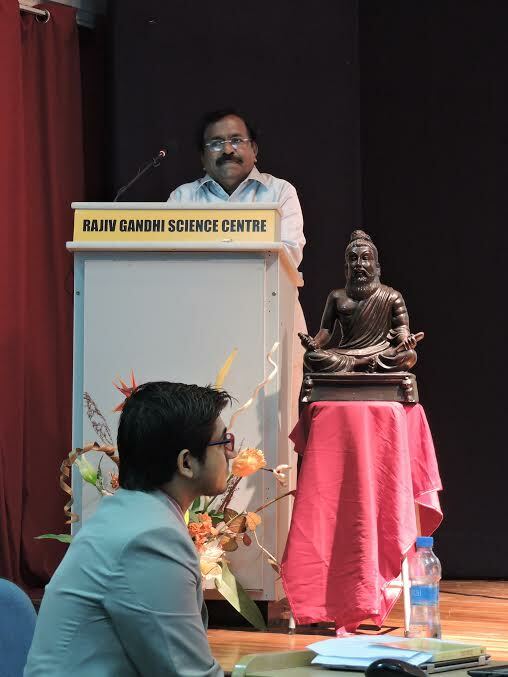 Dr. S. Padmanabhan’s speech centered around Bodhidharma’s connection with the Southern most part of India, which was the birth place of the martial arts Kalari and Varmam. 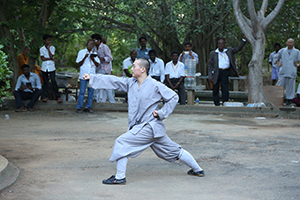 A number of cultural programme by the performers from India, Hongkong, China and Korea enhanced the strength of this international event - chiefly the Kung fu by the monks of he Shaolin Temple, China and the Chan Tea Ceremony by the Koreans touched the mind and soul of the participants. 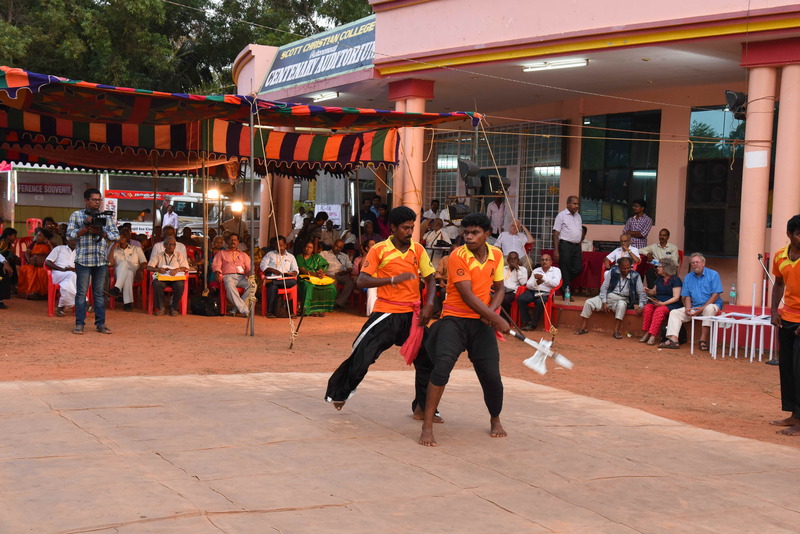 The dance drama on the Life and Teachings of Bodhidharma with the participation of around 45 dancers of the Srirangam Revathy Muthusamy troup remains ever green in the memory of the participants- The entire programme opened new avenues for the study of the external history of the ancient Tamils- one of the most important sea-faring races of the globe, next only to the Greeks and the Romans. 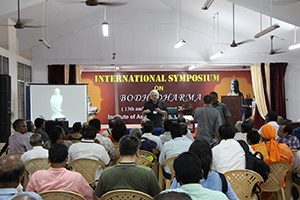 It is indeed a great pleasure for us to invite you to participate in the International Seminar on Bodhidharma to be held in Chennai in August 2015. The present international conference is on Bodhidharma, a Buddhist Monk from Tamil Nadu who went to China during 6th c. AD and established the Chan school of Buddhism and exerted deep impact on the life style of the people of Asia. 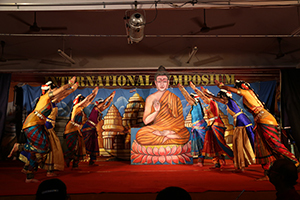 It is remarkable that the medieval traders and Buddhist monks of India served as our true cultural ambassadors since they carried with them the rich cultural traditions of this country to various parts of Asia along with their mercantile commodities and the message of love and compassion of the Buddha. This great message of the Buddha radiated its rays over the benighted world and brought the people of Asia closer than ever and developed spiritual kinship and symbiotic relationship among them. One such spiritual and cultural ambassador was Bodhi-Dharma, a prince of Kanchipuram, the capital city of the Pallava dynasty, who went to China in the fifth century AD and founded the Chan/Zen school of Buddhism. The teachings of this great saint from the Tamil soil has transformed the life and culture of the people in China, Japan, Korea, Vietnam and many other countries and he is venerated as the first Zu (patriarch) of Zen Buddhism. The Chinese manuscripts show the birthplace of Bodhi-Dharma as “Kang-zhi”, which researchers believe to be Kanchipuram of Tamil Nadu, a great spot of learning and cultural diffusion during the times of Bodhi-Dharma. Mahayana or Zen Buddhism has given birth to a vast literary corpus. The Japanese worship Bodhi-Dharma as Dharmazan. If Gautama Buddha is the Light of Asia, Bodhi-Dharma is a great Asian beacon of philosophy. 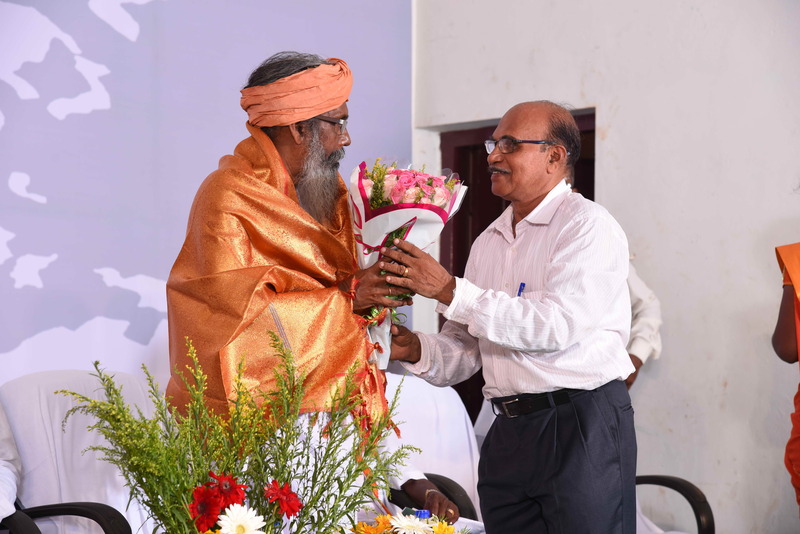 It is a matter of great pride for all of us that this great Buddhist teacher hailed from Kanchipuram, one of the spiritual city of ancient India. 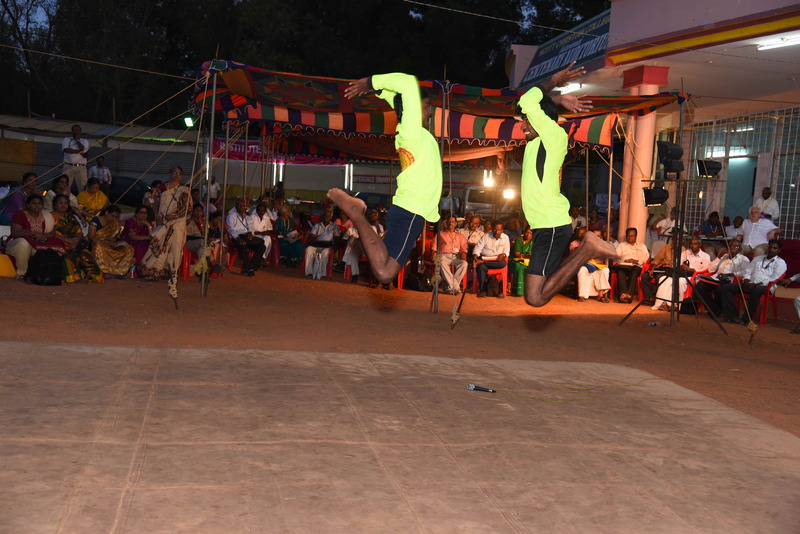 Bodhi-Dharma taught our Kalari art, the unique martial art form of South India to the Chinese, and this later evolved into various forms of martial arts in Asia. The Zen Buddhism brought about revolutionary changes and enlightenment in the culture and lives of not only practitioners but also ordinary people in East Asia, including China, Japan, Korea, Vietnam and other countries. In our contemporary world, the influence of Zen Buddhism is not waning, but rather it is vigorously expanding worldwide, and its importance is increasing even more. 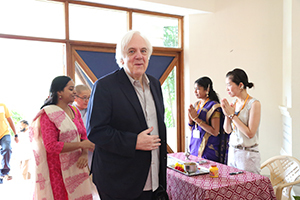 To help advance the study of Indian philosophy and Mahayana Buddhism, we are now in the process of establishing a Buddhist Study Centre named after Bodhi-dharma in Kanchipuram, his birth place. It would serve as a centre of study and meditation for Buddhists and scholars from all over the world. 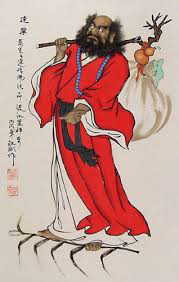 Eventhough Bodhidharma and his Zen Buddhism are popular worldewide, they are not well known in the birth place of Bodhidharma. 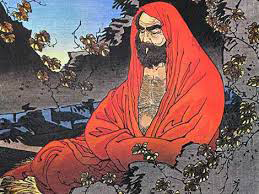 A through study of Bodhidharma and his teaching in relation to his native country is highly indispensible to have an objective understanding about this great teacher and philosopher. We are sure that this will help to get a holistic understanding of Bodhidharma whose roots are in the spiritual soil of India. 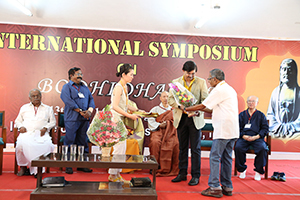 Therefore, we have decided to organize a two day International Conference on Bodhidharma in Chennai on 13th and 14th of August 2015. The seminar will be organized by the Institute of Asian Studies, Chennai, Institute of Seon (Zen) South Korea and a few other centres of international reputation with the support of the ICCR, Govt. of India. We request you to participate in this unique event either as a paper presenter or observer. The last date for the submission of the abstract of research paper ( in about one page) is 31st May 2015. The full paper should be submitted through e mail by 15th July 2015. We seek your support for the successful hosting of this unique programme. வரும் ஆகஸ்டு மாதம் 13,14 ஆகிய இரு நாட்களில் அனைத்துலக போதிதர்மர் மாநாடு சென்னையிலுள்ள ஆசியவியல் நிறுவன வளாகத்தில் நடைபெறவுள்ளது. இம்மாநாட்டினை ஆசியவியல் நிறுவனமும், ஜப்பானிலுள்ள அனைத்துலக போதிதர்மர் கழகமும், சீன நாட்டிலுள்ள ஷவோலின் ஆலயமும், மொரிசியசு நாட்டிலுள்ள அனைத்துலக புலம் பெயர்ந்து வாழும் தமிழர்கள் அமைப்பும், ஹாங்காங் நாட்டிலுள்ள அனைத்துலக போதிதர்மர் கூட்டமைப்பும் இணைந்து நடத்துகின்றன . கி.பி. 6ஆம் நூற்றாண்டின் தொடக்கத்தில், தமது எழுபதாவது வயதில் தமிழத்தின் ஆன்மீக நகரமான காஞ்சிபுரத்திலிருந்து புறப்பட்டு, மாமல்லபுரத்திலிருந்து கடல் வழியாகப் பயணப்பட்டு தமது 73வது வயதில் சீன நாட்டின் கான்சாக் பகுதியைச் சென்றடைந்த போதிதர்மர் சான் பௌத்தம் என்று சீன மொழியில் அழைக்கப்படும் தியான பௌத்தப் பிரிவை சீன நாட்டில் நிறுவினார். 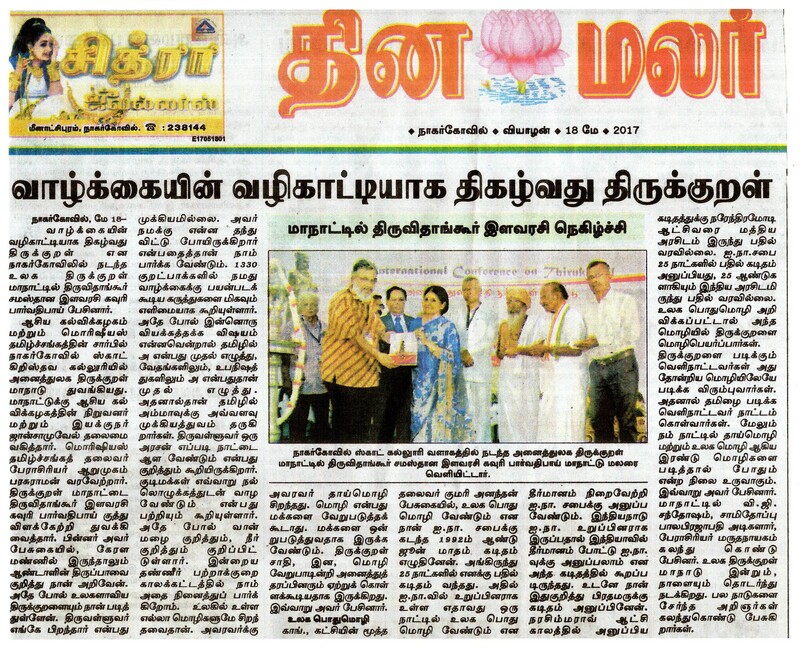 தமிழகத்திலிருந்து சீனநாட்டிற்கு புலம் பெயர்ந்து சென்ற தமிழரான போதிதர்மரை சீனநாட்டில் வாழ்ந்த தமிழ் வணிகர்கள் வரவேற்று அவரது பணிகளுக்குப் பல நிலைகளில் துணை நின்றனர். 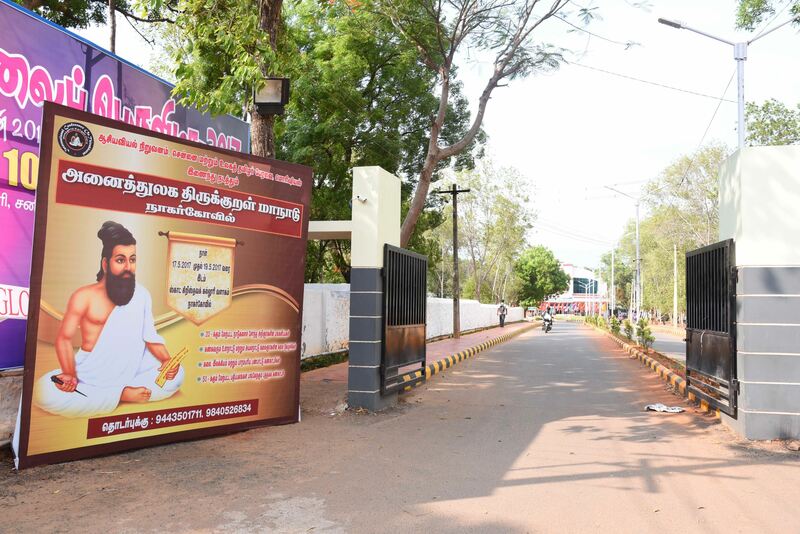 சீனநாட்டிலுள்ள ஷவோலின் ஆலயத்திற்குச் சென்ற போதிதர்மர் அக்கோயிலின் பக்கத்திலுள்ள ஒரு குகையில் சுவரை நோக்கி 9ஆண்டுகள் தொடர்ந்து தியானம் செய்ததாகவும் தமிழகத்து மூலிகை மருத்துவ முறைகளையும், வர்மம், களரி போன்ற தற்காப்பு கலைகளையும் அவர் சீன நாட்டினருக்குக் கற்று தந்ததாகவும் அறிகிறோம். சீனநாட்டு மக்கள் இவரை தாமோ என அன்புடன் அழைத்தனர். போதிதர்மர் கற்றுத்தந்த சான் எனும் தியான நெறி சென்(Zen) என்ற பெயரில் ஜப்பானிலும், சியோன்(Seon) என்ற பெயரில் கொரியாவிலும் பரவியது. அவர் கற்றுத்தந்த தற்காப்புக்கலை ஆசிய நாடுகளில் கும்ஃபூ, கராத்தே, சொழிஞ்சோ கெம்போ என்று பல வடிவங்களில் பரிணமித்தது. தமிழ்ப்பண்பாடு ஆசிய நாடுகளெங்கும் பரவக்காரணமாக அமைந்த தமிழ்த்துறவி போதிதர்மர் சான் அல்லது சென் பிரிவைத் தோற்றுவித்த அற்புத மகானாக, தென்தமிழ் நாட்டு புத்தராகத் திகழ்கின்றார் . தமிழ்ப்பண்பாடு ஆசிய நாடுகளெங்கும் பரவக் காரணமாயிருந்த போதிதர்மர் குறித்த இந்த அனைத்துலக மாநாட்டில் ஏறத்தாழ 30 நாடுகளைச் சார்ந்த அறிஞர்கள் ஏராளமான ஆய்வுரைகளை வழங்க உள்ளனர். போதிதர்மாரை மையமாகக் கொண்ட பல கலைநிகழ்ச்சிகளும் இடம் பெற உள்ளன. மைய அரசின் தேசிய புத்தக அறக்கட்டளையின் துணையோடு புத்தகக் கண்காட்சியும் இம்மாநாட்டின்போது இடம்பெறவுள்ளது. நூல்வெளியீட்டாளர்கள் தமது வெளியீடுகளை இக்கண்காட்சியில் இடம்பெறச் செய்ய வாய்ப்புக்கள் வழங்கப்படும். 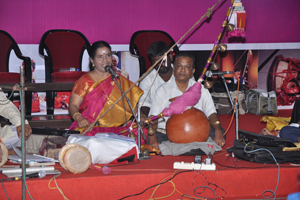 கல்வி வள்ளல் டாக்டர். எம்.வி. ஜெயராமன் அவர்களின் பெயரில் தமிழாய்வு அறக்கட்டளையொன்றும் ஆசியவியல் நிறுவனத்தில் இம்மாநாட்டின்போது தொடங்கி வைக்கப்பெறும். மாநாட்டில் கட்டுரை வழங்குவோராகவோ அல்லது பார்வையளராகவோ வாசகர்கள் கலந்து கொள்ளலாம். மாநாடு குறித்த விரிவான தகவல்கள் ஆசியவியல் நிறுவனத்தின் வலைத்தளத்தில் www.instituteofasianstudies.com உள்ளன. மாநாட்டில் கலந்து கொள்ளப் பதிவு செய்ய விழைவோர் பதிவுப்படிவங்களை ஆசியவியவியல் நிறுவன வலைத்தளத்திலிருந்து பதிவிறக்கம் செய்து கொள்ளலாம். Greetings to you from the Institute of Asian Studies. 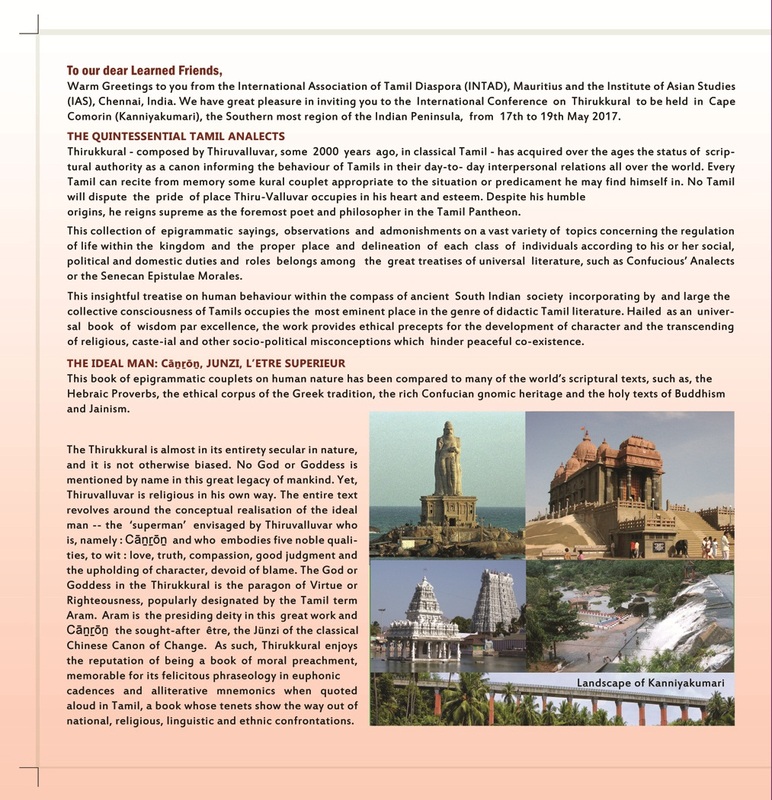 I am glad to inform you that in consonance with the resolutions of the First International Conference on Tamil Diaspora held in Mauritius, the second International Conference is going to be organized in Durban, South Africa from 16th to 19th June, 2016. 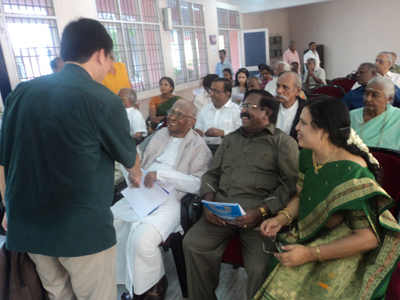 The tentative theme of the Conference shall be Tamil Language and Culture in an era of Globalization. 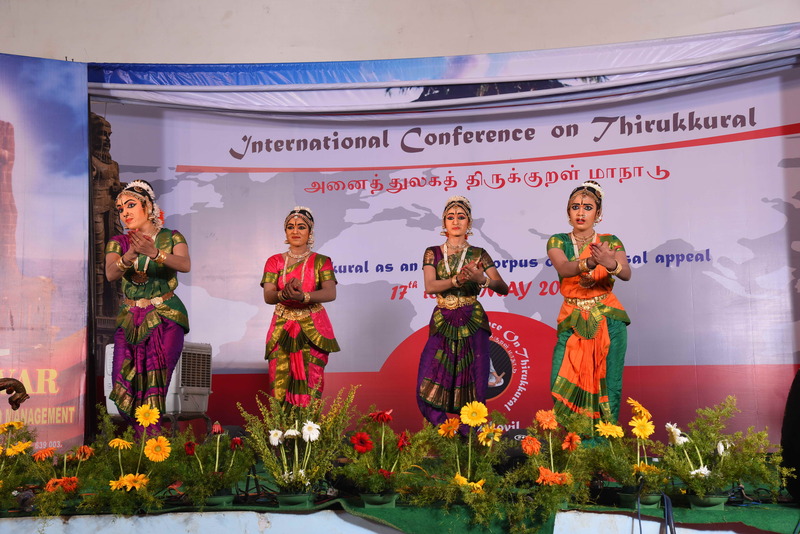 The Conference is organized jointly by the International Association of Tamil Diaspora (INTAD) Mauritius, Institute of Asian Studies, Chennai and the South African Tamil Federation, South Africa. While requesting you to participate in this significant international conclave, I welcome all your suggestions and feedback to organize this event very successfully in Durban. I look forward to your kind co-operation in this venture. Diaspora” is the term for a group of persons with a common group identity, unique in culture and language, dispersed or scattered in various parts of the world. A diaspora maintains and nurtures its own civilizational and cultural identity and its aspirations are linked with their country of origin, as well as with the diaspora worldwide, making it a global unity with global identity. 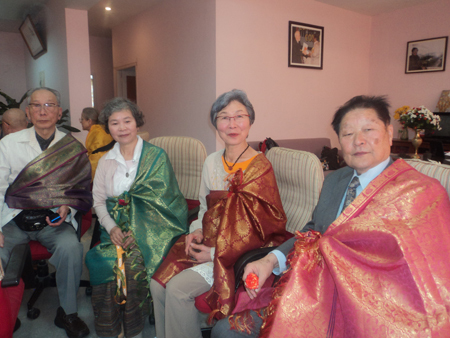 The Jewish, Chinese and Indian diasporas are some of the vibrant diasporas with a presence all over the world. The Tamil diaspora is a demographic group of Tamil people, of Indian and Sri Lankan origin, who have settled in various parts of the world. 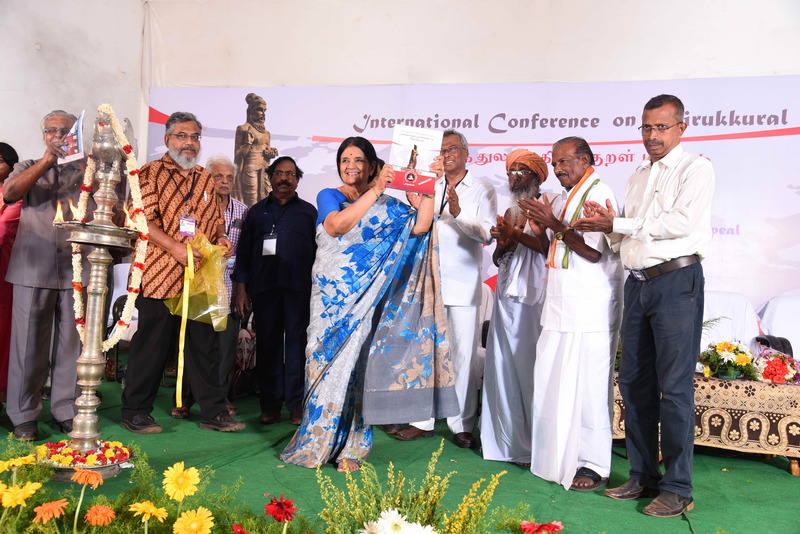 Among the Indian diasporas, the Tamil diaspora is a very strong and vibrant community whose presence has been in Asia and Europe from age-old days, when the Tamil people developed commercial ties with various countries all over the world. Tamils are a sea-faring race and their trade with the western and eastern worlds has been documented from the pre-Christian era. This early commercial trade, followed by the travel of Buddhist monks and Saivite and Vaishnavite saints to East and Southeast Asia, then the conquering of the later Chola kings of Southeast Asia all resulted in early Tamil settlements in various countries. Migrations of the above type changed into contract and indentured labour migrations during the early colonial days, especially after the abolition of slavery in the British Empire in 1834. 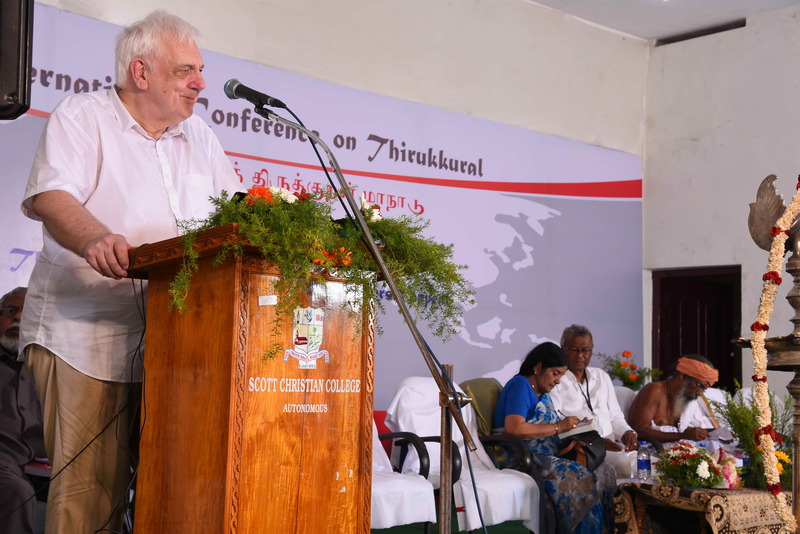 In due course, this changed into the migration of professionals and other working groups in search of job opportunities, as well as refugees and asylum seekers owing to political and social pressures--the latter especially from Sri Lanka. This phenomenon, which continued over centuries on a small scale, has of late resulted in mass migration with a common identity on a global level. Today, the Tamil Diaspora can be found in Malaysia, Singapore, Indonesia, the Middle East, Réunion, South Africa, Mauritius, Seychelles, Fiji, Guyana, Myanmar, Thailand, Trinidad and Tobago, the French West Indies, Europe, Australia, Canada, and the United States of America. 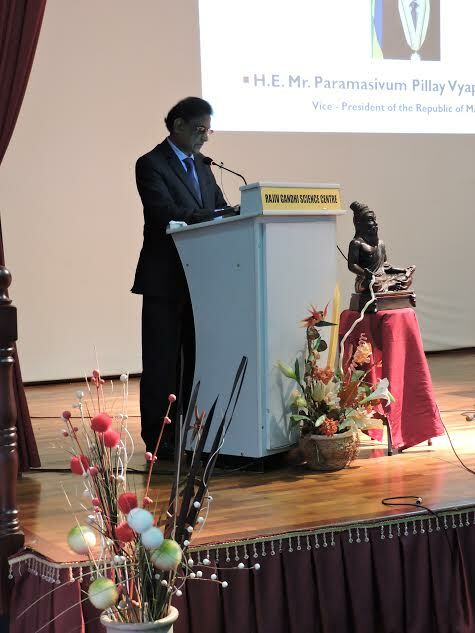 It is proposed to organise an “International Conference on Tamil Diaspora” in Mauritius, with a view to pool together members of the Tamil diasporic countries and the scholars evincing keen interest in the study of the Tamil diaspora, to promote academic research on this most fascinating theme at the international level. 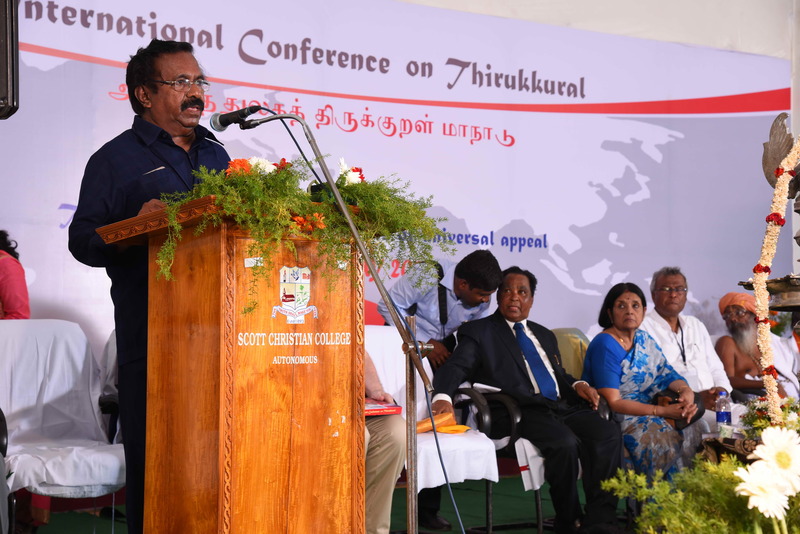 This conclave would bring together people from the Tamil Diaspora living in various parts of the world and foster interaction and solidarity among widespread groups. As described in the foregoing passage, the dispersal of Tamils over the globe is not of recent origin. 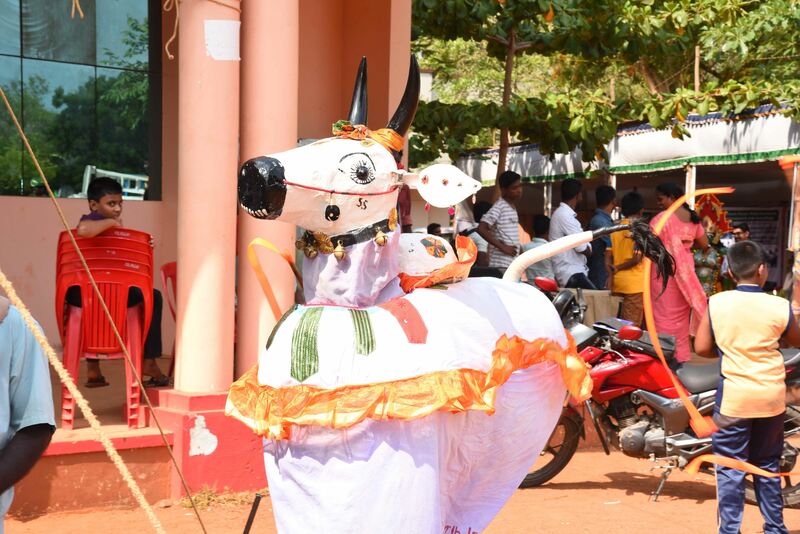 There are currently estimated to be at least one-hundred million Tamil people spread across distant seas, living in more than 70 different countries and islands. Among these are many thousands living in various parts of the world as refugees and asylum seekers. The Tamil diaspora is a vibrant group of people who, though separated by great distances, live with a spirit of oneness and togetherness. They are deeply rooted in a common unique ancient heritage, possessing a magnificent culture and eminent language, including a body of literature classical in character and universal in nature. This heritage, this togetherness are not only matters connected with the culture of the past. The rich Tamil culture and spirit of oneness is a solidarity endowed with dynamism and growth, consolidated struggle, and continuous suffering. This solidarity is given purpose and direction by the aspiration of a people for the future--a future in which they and their children may live in equality and freedom in an emerging one-world society. 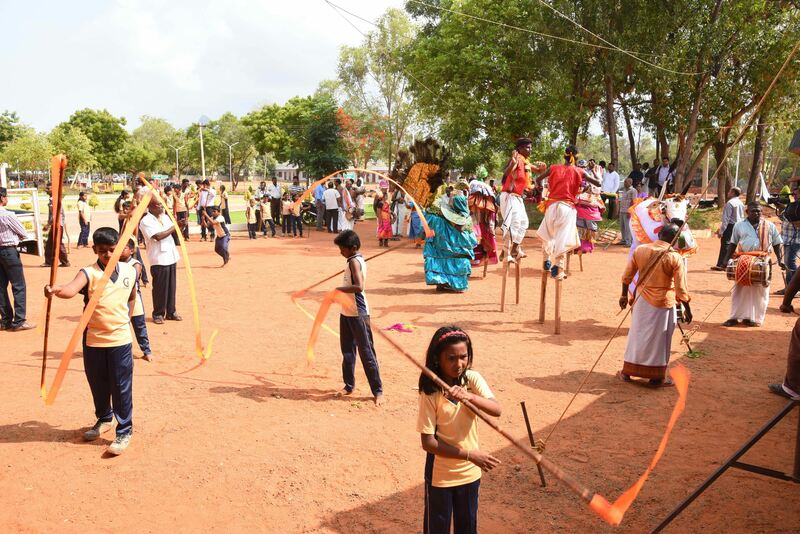 The Tamil Diaspora’s passion and love for their language and culture is fast-growing to be recognized as an international force. Language and culture are two facets of the same identity. Language is a major cultural element; culture is everything which is socially learned and shared by all the members of a society. Culture is an organised system of behaviour and said to be normative, as it defines standard of conduct. Isolated diaspora communities often preserve their cultural heritage more than their fellowmen still dwelling in the homeland. 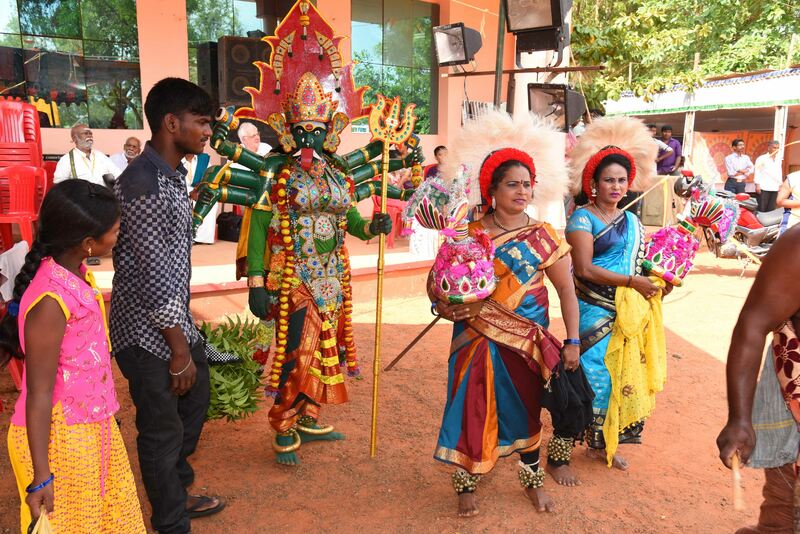 Each Tamil diaspora community has had to wage its own struggle over generations, to achieve economic prosperity while yet preserving cultural identity and ancestral traditions. Each has its own stories of how they have overcome obstacles peculiar to their adopted homeland. Despite their relative isolation from their native land, they have preserved and nurtured their multifaceted religious traditions and other cultural elements for posterity. 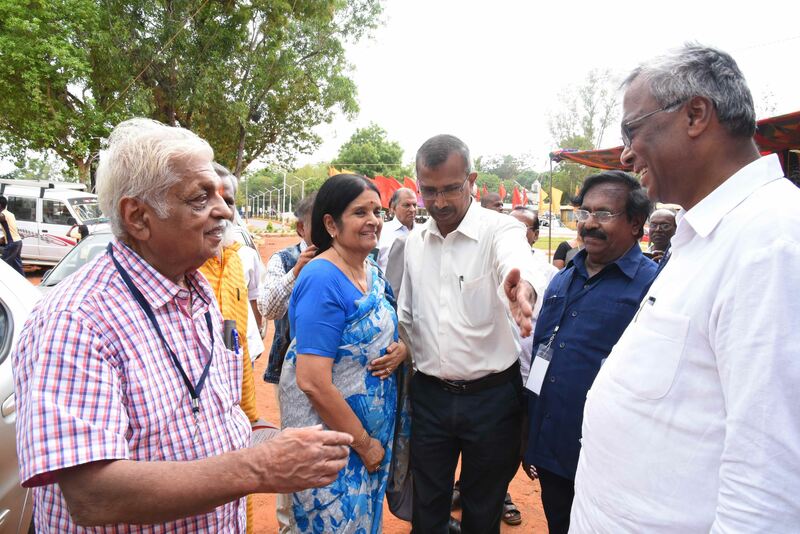 The digital revolution has strengthened the bonds of the Tamil diaspora, forging new cultural, economic, and political togetherness, and deep-rooted kinship ties. As Piet Baker mentioned in his work entitled Remembering Roots (1995) the “Internet made it possible for members of diasporic groups to communicate regardless of time and distance. Their homeland, their national identity, and the ethnic, social, cultural and political meanings of this identity are the most covered topics in these online meeting places”. The dual attachment towards both the country of origin and the country of resettlement is not as paradoxical as it may seem. It is a fact that some people with home in two countries are showing an amazing capacity to maintain dual identities – with strong cultural ties and contributions to both places. 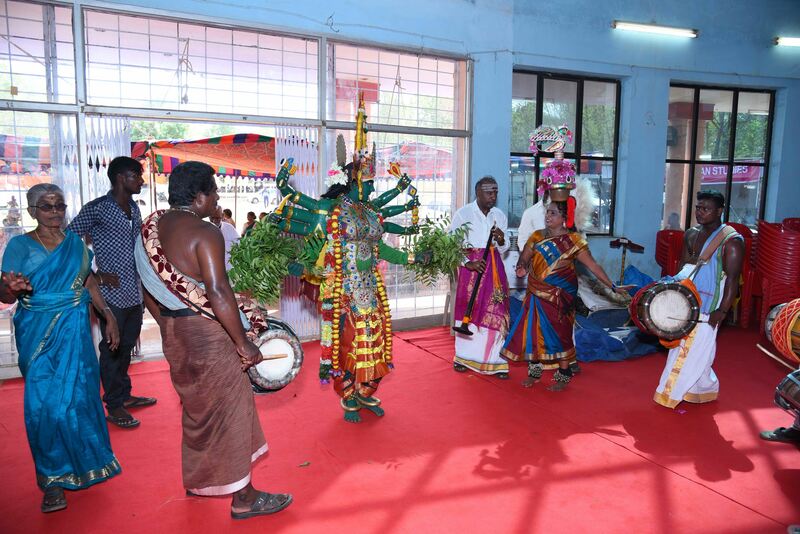 The dispersed Tamil people’s sense of belonging and togetherness has resulted in the flowering of multi-faced cultural, religious and media growth to such an extent as to excel these activities even in the lands of their origin. The early settlement patterns of the Tamils can be traced to the sugar cane plantations of Mauritius and Réunion in the Indian Ocean; Jamaica, Trinidad and Tobago in the Caribbean; Guyana and Suriname in South America; plantations in South Africa; rubber estates and railways in the Federated Malay States (Malaysia); coffee and tea estates in Ceylon (Sri Lanka); and to coal mines of New Caledonia of Australia in the Pacific Ocean. 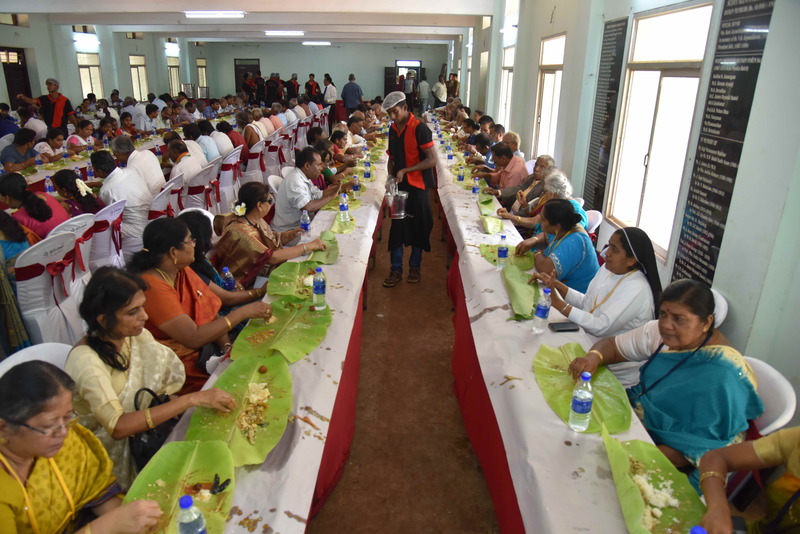 It is estimated that as base habitation India has almost 72,138,000 and Sri Lanka 5,000,000 Tamils. The Andaman and Nicobar Islands, south of the Bay of Bengal in the Indian Ocean have over 40,000 Tamils, there the second largest ethnic group. In these islands there are over 6,000 Tamil children attending 33 Tamil schools. In the early colonial era, Indonesia had 50,000 Tamils. Tamils were taken there by the Dutch colonial masters in the 1830s to build up Dutch plantations. The Tamil people were used for hard labour and, as the conditions were not favorable, many returned to their homeland in the 1940s. A concentration of somewhere between 2,000 and 10,000 Tamils remained in the region of Northern Sumatra. Most of these were Hindus, but there were Christians and Muslims, as well. 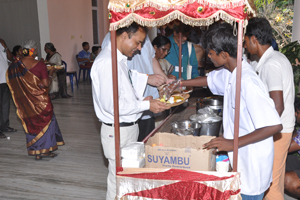 Singapore has about 200,000 Tamils, who constitute the third main cultural group in that country. Malaysia has a Tamil population 1,800,000 strong. Myanmar (Burma) had a Tamil population of 200,000 at one time, but since the end of the Second World War the number has been reduced. Vietnam has a small minority of about 3,000 Tamils, mostly in Ho Chi Minh City. Cambodia has 1,000 Tamils, China 5,000 and Thailand 10,000. Mauritius has a Tamil population of 115,000, the larger bulk from the southern state of Tamil Nadu who arrived there from 1727 to work in the sugar cane plantations. Réunion is an island in the Indian Ocean being run as a French Department. Tamil inhabitants came there as far back as 1848 as indentured labourers, mainly from Pondicherry and Karaikal, the French territories in Southern India. On Réunion there are currently about 120,000 Tamils. 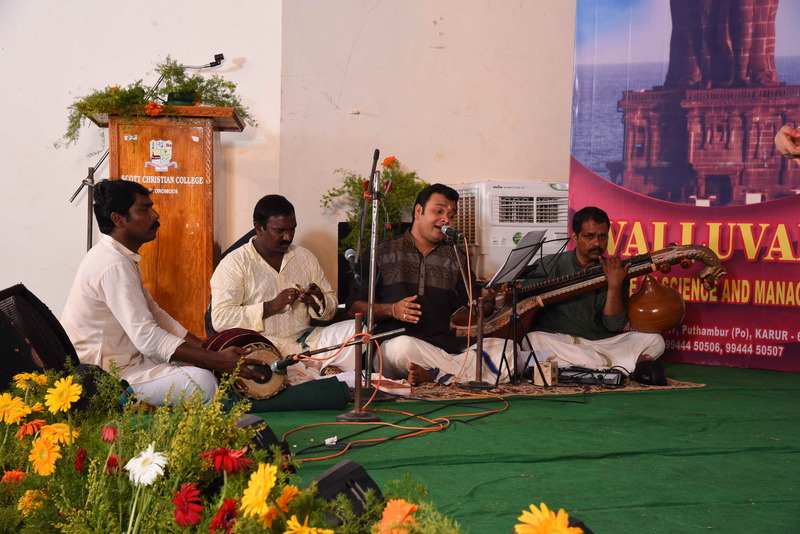 There are, along with this community, a large number of Hindu temples run by voluntary organizations at which Hindu and Tamil cultural links are well-preserved. Seychelles, a group of islands in the Indian Ocean, has a Tamil history of about 230 years. A shipload of migrants landed here in 1770, composed of diverse ethnicity. 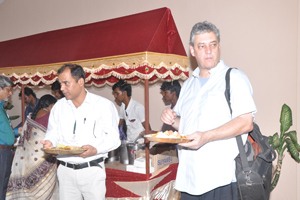 There are now about 4000 Tamils working in trading, as well as in professions. In South Africa Tamil migration started from 1860, first for indentured labour (for which the first batch 340 Tamils were brought). Now there are more than 250,000 Tamils spread over many cities, the concentration being in Natal and Durban. Denmark has around 7,000 Tamils, Fiji has around 110,000, France around 100,000, Germany around 50,000, Switzerland approximately 40,000, Italy around 25,000, Netherlands around 20,000, and Norway around 10,000. Again, the above statements about the demographic spread of the Tamil Diaspora is tentative. There may be large variations and it needs to be updated. Thus the statistic details about the Tamils in other Diaspora countries should be collected through field study and updated. 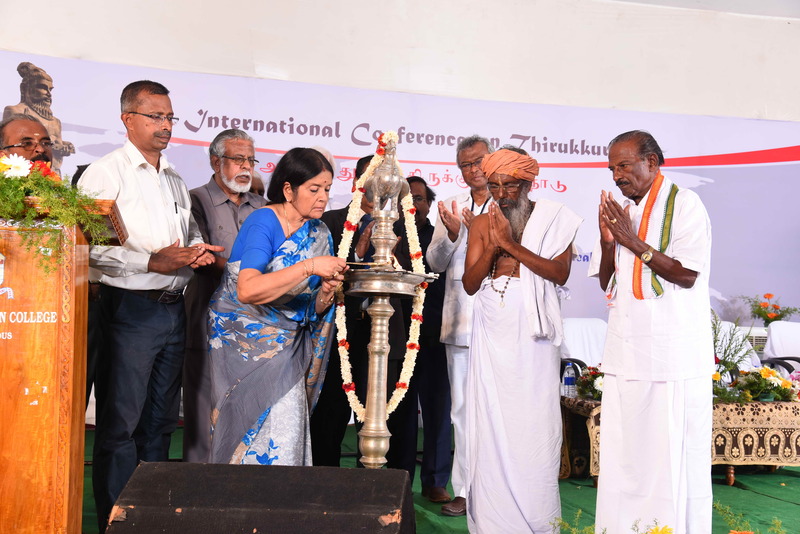 Since this is the first conference which forms the basis for a number of subsequent programmes of international character, its theme can be a systematic and objective survey of the Tamil diaspora all over the world, with objective and authentic data, statistical details and connected discussions on various aspects of the cultural heritage. 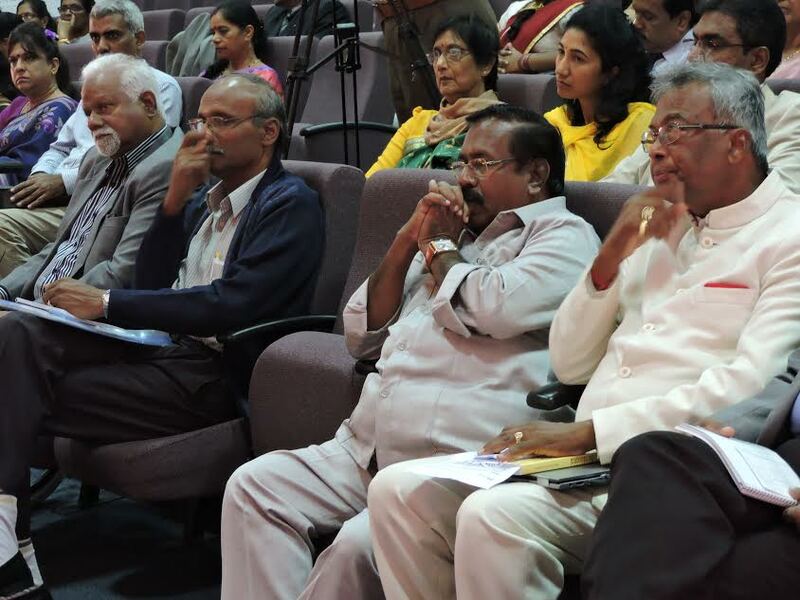 The conference should pool together all available resources for making further studies on various aspects of the Tamil diaspora communities--separately as well as holistically. 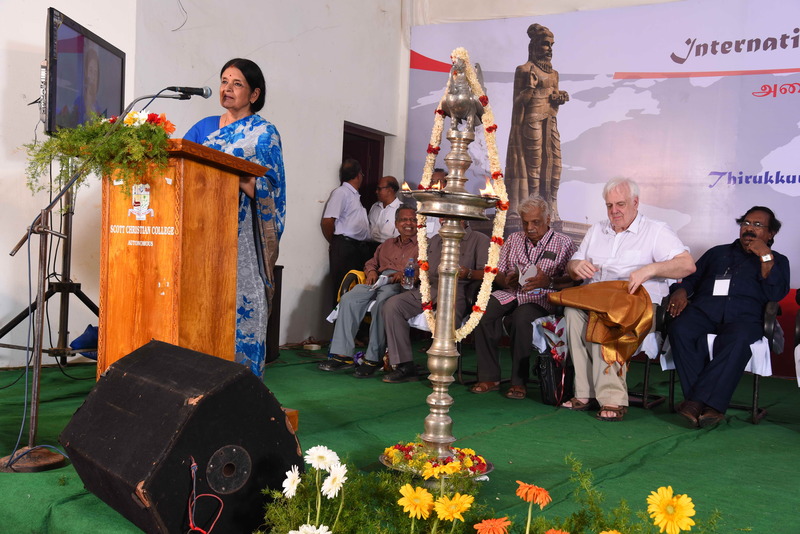 Each research paper pertaining to each country may present a historical background about the place in Tamil Nadu from where the Tamils migrated in various periods, and the socio-economic and cultural backdrop of the migration. The type of migration, the journey to the new land, etc. should be presented in a brief manner. Profiles of the land and people of the country migrated to should be presented briefly, and the places in which Tamils have settled should be enumerated. Economic conditions, educational rate, social status, involvement in social, political, corporate activities, etc. should be briefly explained. 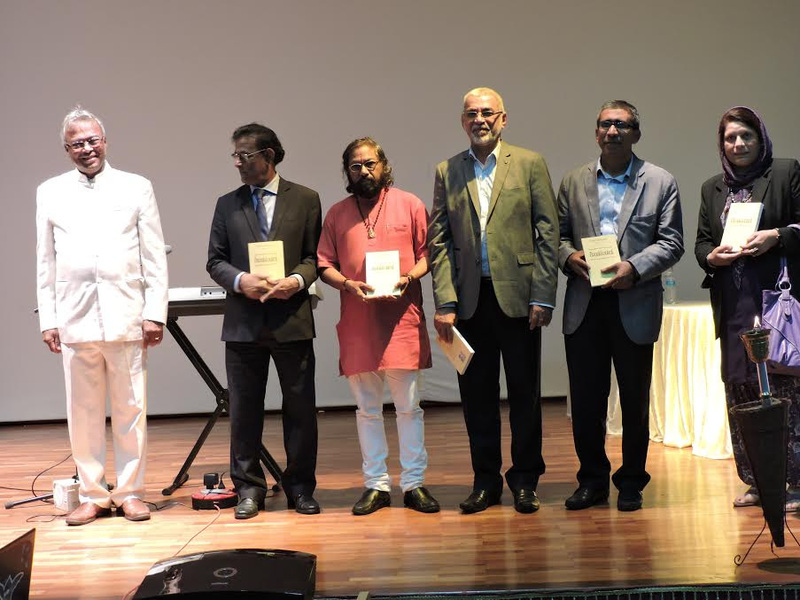 The second part of the paper should present descriptive data covering all aspects of the socio-economic and cultural factors of the life-style of the Tamil diaspora in the country to which they have migrated. Land and the people of the diaspora country. Dispersion of the Tamil diaspora. Demographic spread of the Tamils. Different categories of the Tamil diaspora. Socio-economic position of the diaspora. 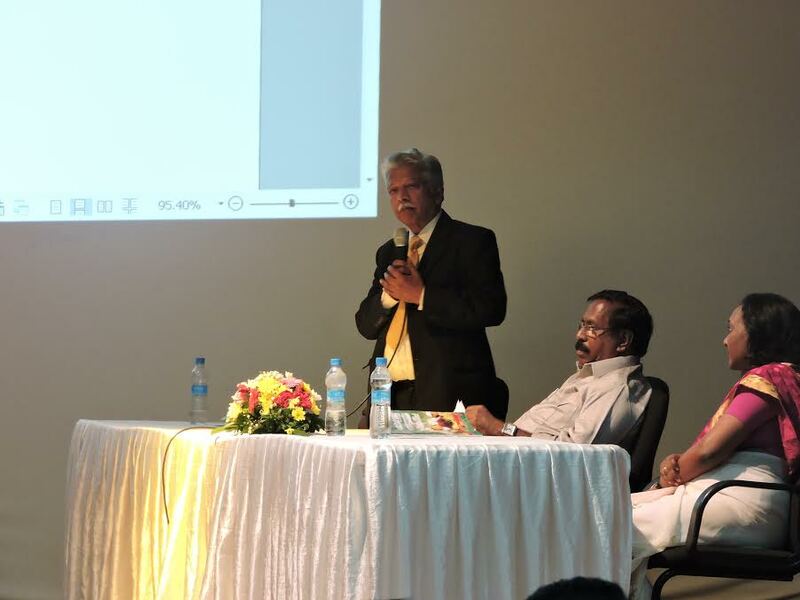 Impact of the country of migration on the Tamil diaspora. Contributions of the diaspora to the country of their migration. 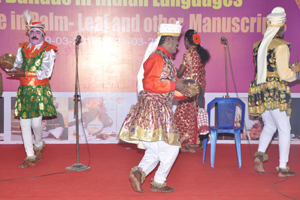 Efforts to preserve the cultural and linguistic heritage of the mother country. Issues related to ethnic identity in the Diaspora country. A review of the current position of the diaspora in the country of migration. The lifestyle of the diaspora in the country of migration. What is lost and what is gained. 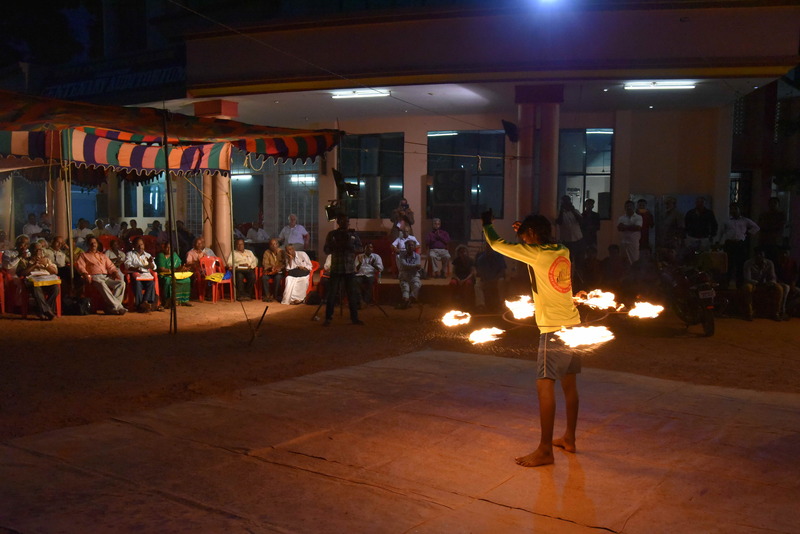 The lifestyle of the Tamil diaspora in comparison with the lifestyle of their counterparts in the nearby Diaspora countries. The vision of the Tamil diaspora about their future. Solutions at which to arrive. The study should be both descriptive and historical, based on data drawn from different groups and collected through objective field survey of different periods. The general presentation shall be on historical sequence. Wherever necessary, comparative methodology can also be attempted. 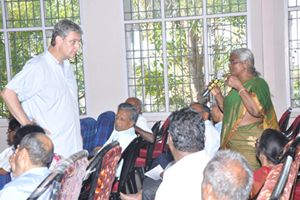 The study should be holistic, taking into account all the vital issues of the Tamil Diaspora.